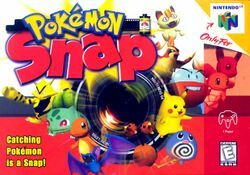 Pokémon Snap (ポケモンスナップ or Pokémon Sunappu in Japanese) is a video game developed by HAL Laboratory and published by Nintendo for the Nintendo 64. It is part of the Pokémon series, and was first released in North America on July 27, 1999. It was originally shown as a Nintendo 64DD game. The game was released onto the Wii Virtual Console in December 2007. This page was last edited on 12 January 2017, at 20:59. This page has been accessed 51,204 times.